A music wall can provide hours of entertainment for the kids! Want your little kids to explore and be more active outdoors? 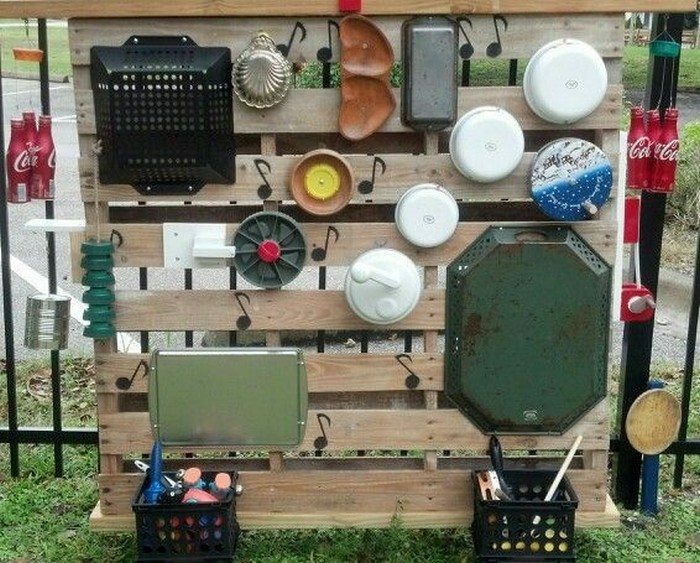 Then you’ve got to give them something really fun and entertaining, like this DIY outdoor music wall! There are many ways to create an outdoor music wall/sound wall. You can use your existing fence or build something to mount the ‘musical instruments’ on, such as the 2×12 timber you see above. You can also buy peg boards or other items like a pallet. This DIY play equipment is very inexpensive, too! Anything that makes a good sound when hit by the ‘drum stick’ can be mounted on this wall. So simply search through your old items/recycling bin – you don’t need to buy new materials for this project! You can even use scrap PVC pipes from a previous DIY project or parts of a broken musical instrument or toy, like the xylophone. As long as you put everything together so that they’re secure, this DIY outdoor music wall is a great play equipment your kids will surely love! Want to build one for your kids? Be inspired by more examples of an outdoor music/sound wall in our album. You can also learn more about the featured music wall above by heading over to the step-by-step tutorial linked below! Previous articleBuild a mobile kitchen island unit with timber crate pantry storage!